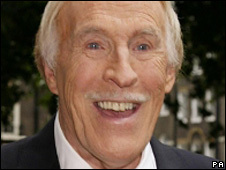 Justin Lee Collins, who used to host a Strictly Come Dancing spin-off show, has entered the ageism debate by calling for Bruce Forsyth to retire. The 35-year-old, who presented Strictly Come Dancing: On Three in 2004, said Forsyth was "too old" to carry on. "I still think Bruce in his day was the best at what he did, but I think he should have given up three or four years ago," Lee Collins said. Forsyth, 81, has presented the BBC One show with Tess Daly since it began. Lee Collins, who was replaced by Claudia Winkleman when the Strictly Come Dancing companion show moved to BBC Two, said he would like to see Sir Terry Wogan take over as the main presenter. However, the presenter admitted his TV encounters with Forsyth had not been comfortable. "As legendary as he is - I grew up loving him, as did my parents, as did my grandparents - he wasn't particularly nice to me on that show," he said. "I loved him and they do say never meet your idols because you're always going to be disappointed and in the case of Bruce I was disappointed. He was very rude." Speaking during promotional duties for his new book, Lee Collins said many people were "frightened" to say anything negative about Forsyth because he was a broadcasting "legend". "It would be like saying something rude about the Queen, you just don't do it. "But he does a very, very difficult show on TV, and I think particularly on that first series, he may have found it difficult," he said. "I still love to watch it, religiously. I never miss it, if I'm away it's recorded. It doesn't get much bigger or better than Strictly," he added. His comments come after the BBC was criticised for replacing judge Arlene Phillips for the younger Alesha Dixon. 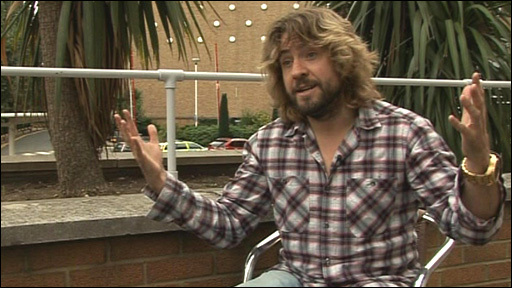 But Lee Collins said Dixon - who won the show in 2007 - was the "perfect choice" for the role. "She would be brilliant, but she's clearly had her wings clipped and they just need to let that bird fly," he said. "The only one on that panel with any technical knowledge is Len Goodman, as he's the only one with any ballroom dancing experience. "Alesha is just as qualified, if not more so, to comment on the dances than Craig and Bruno because she's done it and she's won it. And she's got personality bursting out of her every pore." Since the pop star started her new role on Friday hundreds of people have complained about her performance, but speaking at a BBC conference on Wednesday, Forsyth also leaped to her defence. "It's very hard to come into something like that. She's got a lot of guts and she can talk from the point of view of being a dancer on the show," he said. The veteran presenter added that the press had been "unnecessarily fierce" and should "give her a chance". Meanwhile the BBC has announced that Strictly and ITV's flagship Saturday night show the X Factor will continue to clash. Next weekend's Strictly show will be two-and-a-quarter hours to give the 14 couples who will be left time to compete. The BBC said it was unable to put the show time back as it would "contractual obligations" over broadcasting Match Of The Day, which is broadcast at 2230 BST. A spokesman said: "The overlap of Strictly with X Factor has happened more than 40 times in the past and, based on last weekend's performances, it doesn't appear to be denting the fortunes of either show."